When my husband and I lived in New Orleans, we used to drink wine and cook dinner together every night. 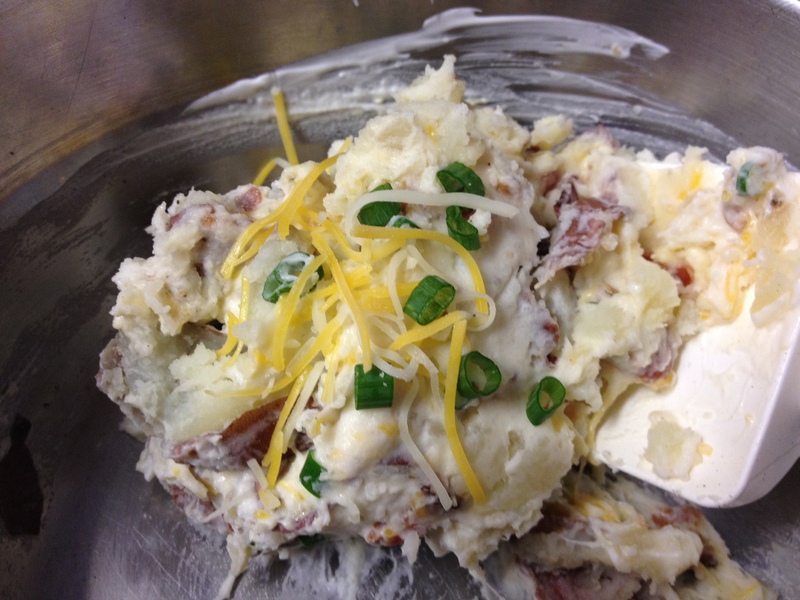 One of the things we made was loaded smashed potatoes because…it was delicious and easy, and we were drinking LOTS of wine back then! I thought this would be a perfect side for Russ and Susannah to make during their double “date night” cooking lesson in IMPULSE CONTROL. Unfortunately, when I went to make this recipe so I could actually write down the ingredients for once, my husband had used most of the potatoes in a soup the week before. I only had nine left! So I made a tiny batch…while drinking wine. For old times’ sake. You know. Don’t worry, I checked my math after I multiplied the ingredients! Cook the bacon and potatoes. The potatoes are done when you give them a squeeze and feel no resistance in the middle. Or when you can pierce them with a fork all the way through to the center. Slice the scallions, crumble the bacon, and measure the cheese and sour cream. Reserve a bit of cheese, scallions, and bacon for garnish. When the potatoes are done, drain them in a colander and then put them into a bowl. Smash them with a spoon or plastic spatula, and fold in everything but the reserved garnish. Taste for salt and pepper. Put them into a serving bowl and garnish the top with reserved cheese, scallions, and bacon.